Place sliced rolls flat-side up on baking sheet. Spread refried beans evenly on the flat sides. Sprinkle generously with cheese. Bake 8-10 minutes or until cheese is melted, bubbly and starting to brown. Serve warm topped with pico de gallo, salsa, chorizo -- anything you like! If I was stuck on a deserted island and could only eat one type of food for the rest of my days, it would be Mexican. I absolutely love it – whether authentic or not-so-authentic, from quesadillas to stuffed poblano peppers. Give me Mexican food for breakfast, lunch and dinner and I’m a happy girl. That’s why I was ecstatic when Tablespoon asked me to make these Mexican Molletes. What a great excuse to make one of my favorite meals! I got to work right away (and may or may not have “worked” on them several dinners in a row – what can I say? They’re that good!). 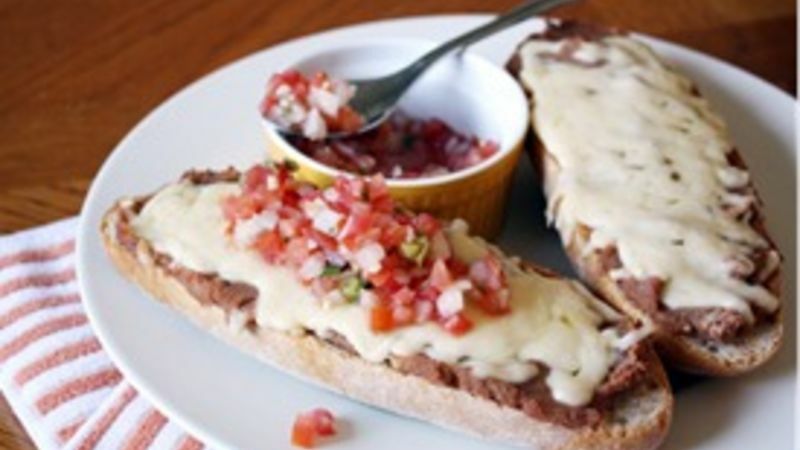 Molletes are easy to love, with warm refried beans and gooey, melted cheese on top of a soft roll topped with zesty pico de gallo, spicy chorizo or cool guacamole. It’s virtually impossible to deny them. Plus, they’re extremely versatile. For the bread, you can use bolillo rolls (the most traditional route), but you can also use baguettes sliced in half, Italian bread, sub sandwich rolls, or even biscuits. As for the refried beans, feel free to use pinto or black beans, or whatever’s your favorite. I prefer refried pinto beans with a hint of green chile and lime. The melted cheese is also pretty fuss-free – use some extra mozzarella cheese you have sitting in your fridge, or go for farmer’s cheese or Mexican Oaxaca cheese. Even cheddar works. As long as it melts and meshes well with the refried beans, you’re good to go. The vegetarian in me loves these Molletes topped with fresh pico de gallo or “soyrizo” – chorizo made with soy and other meatless ingredients – but you can top yours with whatever you like. Guacamole, turkey, ham, spinach, even leftover grilled veggies work great. The next time you’re racing against the clock to make dinner, try these Molletes and you’ll have a yummy Mexican dinner on your table in no time.